Although Rockwell Integrated Sciences Center doesn’t open until fall semester 2019, it’s already providing unique learning opportunities for students. Working with Dave Veshosky and Steve Kurtz, associate professors of civil and environmental engineering, Mary Wilford-Hunt, senior associate director of corporate, foundation, and government relations, organized a series of brown bag lunches over the fall semester to bring students face-to-face with the professionals behind creating the largest capital project in Lafayette’s history. 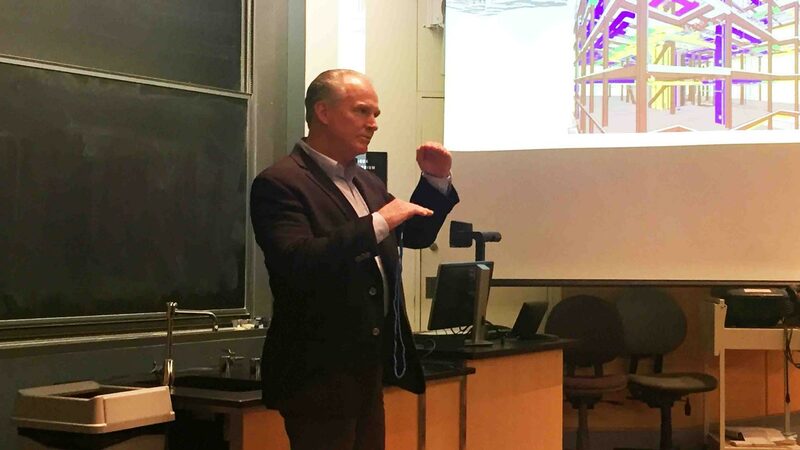 Students heard from the project manager, architect, civil engineer, structural engineer, and construction manager about the design and engineering challenges of building a five-story sciences center on a hillside and between two existing buildings on Anderson Courtyard. 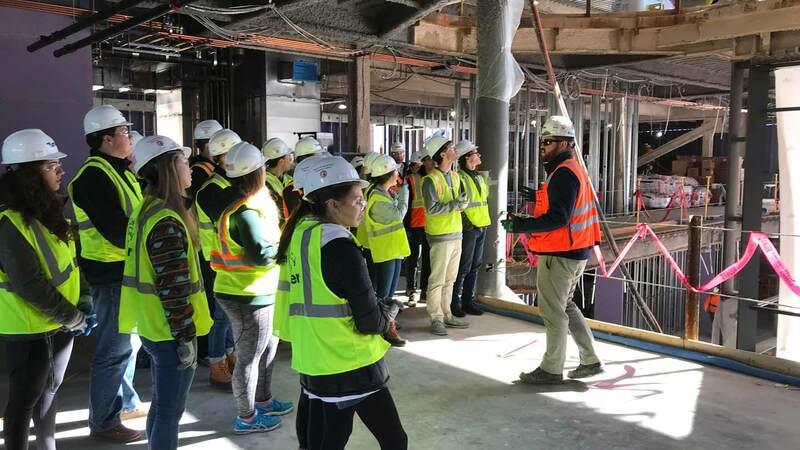 One of the highlights for students was a guided, behind-the-scenes tour of Rockwell, courtesy of Turner Construction Co., the construction firm. Romano says his capstone course focuses heavily on Rockwell. 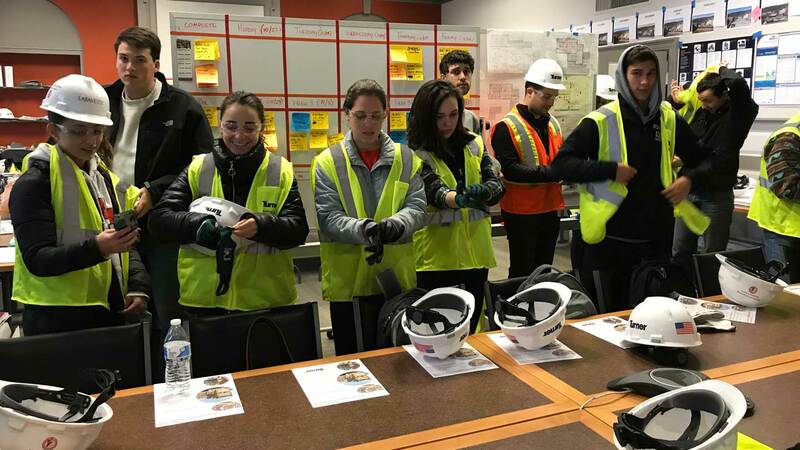 “It has been a comprehensive representation of what a real-world industry experience might look like as a practicing civil engineer,” he says. For Kam Hardy ’19 (engineering studies), the Rockwell series complemented his growing interest in construction. He already has gotten a taste of it working on projects for Clark Construction Group of Bethesda, Md. D. Kirk Harman ’77, co-founder, president, and managing principal of The Harman Group, speaks to students during the Rockwell Integrated Sciences Center brown bag lunch series. The Harman Group is providing structural engineering services for the project. Named for S. Kent Rockwell ’66, one of the College’s most generous benefactors, the $75 million Rockwell Integrated Sciences Center will bring together biology, computer science, and environmental science and studies, along with additional space for neuroscience, and will be connected to Acopian Engineering Center. Kunkel Hall, home to the biology department, will be repurposed following the department’s move into the new building, as will the fifth floor of Acopian, current home to the computer science department. Lafayette’s Dyer Center also will be based in Rockwell along with the Daniel and Heidi Hanson ’91 Center for Inclusive STEM Education and unplanned spaces for future academic growth.